What bike do I get and what do I wear? Beginners often agonize over what beginner motorcycle they should buy as their first bike. Some new riders want to buy a new beginner motorcycle but want a bigger bike that they won't outgrow. Others opt for a used bike for the first year or so to minimize the repair cost when they inevitably drop the bike while learning. This article discusses the alternatives in beginner motorcycles and makes suggestions based on discussions in our Motorcycles forum. Links to actual forum discussions are also provided to allow you to interact with other motorcyclists who may have further advice on beginner motorcycles. Perhaps you've known someone who decided to learn to ride a motorcycle and the first thing they did was buy a big heavyweight machine. Now, it is possible that some people who have natural athletic abilities and mechanical aptitudes may be able to pull this off. The vast majority, however, will not be able to do it. They will end up damaging the bike numerous times and most likely injuring themselves in the bargain. You want to start off with a simple, cheap, standard motorcycle and be prepared to see it fall over a few times while you get used to riding it. I personally dropped my beginner motorcycle at least three times while it was in my garage. I started off with a 1981 Honda CM400T bike that I bought from a friend for $600. This bike was also used by my wife as she learned how to ride. Just be sure that the bike runs well, has good tires and brakes, and is insured. After you've taken the MSF course, you'll need to get lots of practice. Some of that practice may involve simple spills that may cause some damage to the bike. That's why you don't want to spend $20,000 for a new bike as a starter bike. If you're lucky, you'll get through your practice sessions successfully without damage of any kind. You may suddenly feel that the bike you bought and thought was so huge at the time, now appears tiny and you want something bigger. It happens to everyone. Probably you will be able to sell your starter bike for what you paid for it. I did. While you're saving up money for that first starter bike, be sure to set aside money to buy motorcycle apparel and a helmet. You could end up paying more for this than for your beginner motorcycle. If you choose to not purchase special motorcycle apparel, especially while you're learning to ride, you may have to pay medical bills that will far exceed any cost for apparel. You may have observed a variety of attire for people riding motorcycles. Some non-motorcyclists object to the black leather image as being too outlaw. They've seen too many bad biker movies. My objective here is to indicate what you should do to protect yourself while you are riding. Clothing is for comfort, protection, and safety. The first thing you have to protect is your head. Now I know this is a controversial subject and that many groups have expended great effort to lobby states and other governmental agencies for the right to choose whether they want to wear a helmet. I'm only giving you one-man's opinion -- my own. I choose to wear a helmet and I recommend that you wear a helmet. You should wear gloves specially made for riding. If you fall and hit the road, most likely, your hands will hit first. Let the road rash be on your gloves, not your hands. You should wear hard full-length motorcycle boots. Sneakers are not a good thing. Boots limit foot and leg injuries should you fall. They also give you an inch or so more height to allow your feet to touch the ground when you're stopped. I prefer a leather jacket with vents. During the summer, I open the vents to allow air circulation. During the winter, I put in a liner to retain body heat. Riding down the road in the summer in the 90 degree heat will dry your skin quickly. A jacket will retain skin moisture and cool you. If you go down, you will thank the day you decided to wear leather and save your skin. Leather is expensive but it will last a lifetime. Leather pants or chaps are great if you want further protection. I prefer chaps when it starts to get cold. 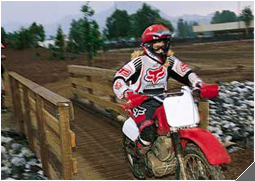 Many riders like full riding suits either of leather or synthetic material. These may be expensive but quite effective. The reality is that riders will ride with almost anything on, sometimes offering practically no protection at all. It's your call but I hope you'll think about what I've recommended here and make an informed decision.